"'When my husband and I don't have a lot of time, we fix this pleasing pasta dish,' remarks Nicole Lynch of Powell River, British Columbia. It's easy to prepare...and easy on the pocketbook at 42 cents a serving. The price comes down even more if you use homegrown tomatoes from your garden." Cook pasta according to package directions. Meanwhile, combine tomatoes and basil in a serving bowl; set aside. In a small bowl, combine the oil, vinegar, garlic, salt and pepper. Drain pasta; add to tomato mixture. Drizzle with oil mixture and toss to coat. Sprinkle with Parmesan cheese. Serve immediately. Nutritional Analysis: One serving (prepared with 1/4 cup oil) equals 237 calories, 11 g fat (0 saturated fat), 2 mg cholesterol, 163 mg sodium, 29 g carbohydrate, 2 g fiber, 6 g protein. Diabetic Exchanges: 2 fat, 1-1/2 starch, 1 vegetable. This was delicious!! It felt like it needed a LITTLE something...so maybe I will toss in some sliced black olives next time!! yum yum!! Does not make very much. I doubled the amount of pasta. Next time I will cut back on the oil as it is way to much. 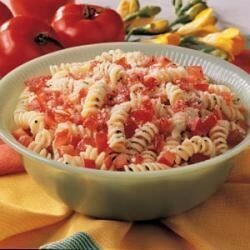 Good as a side dish, especially with garden ripe tomatoes and fresh basil. I added the tomato mixture to the hot pasta and heated slightly. This recipe was o.k. way to much oil! and even dried herbs taste better when they are sautéd a little.